This 82 year old woman is one of the nicest, and one of the happiest, patients we have ever had in our practice. 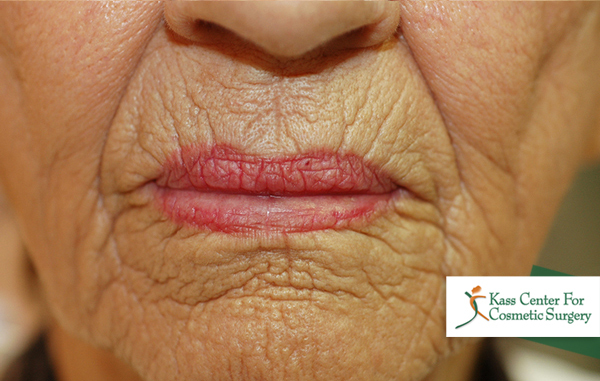 She came in complaining of her skin appearing to look like “old leather”, especially around her mouth. We quickly placed her on a skin care regimen to condition her skin, and in a few weeks she had a Croton Oil / Hetter Chemical Peel. 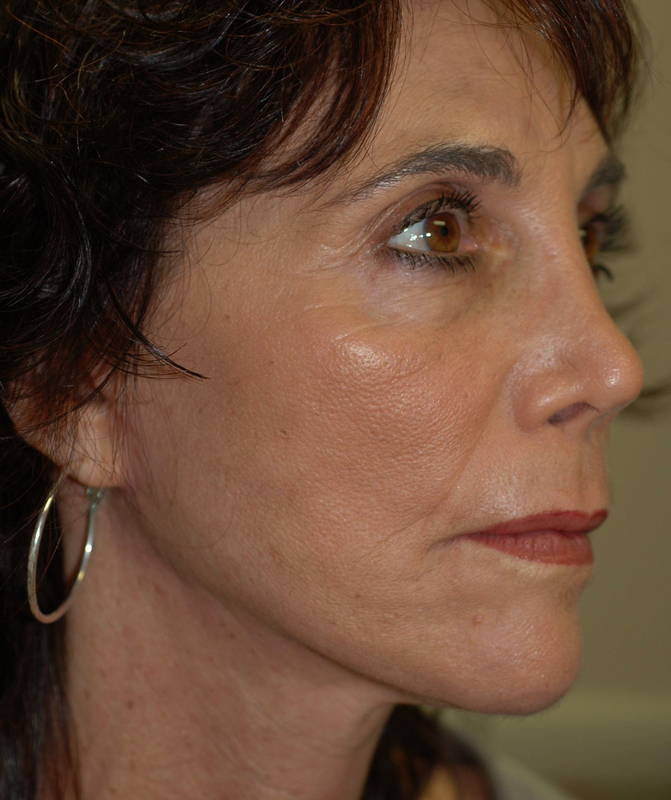 This Deep Facial Resurfacing technique completely rejuvenated her face, taking years off of her appearance. The patient said multiple times that this was the best thing she had ever done for herself–she just couldn’t believe the difference! It would be easy to assume that this is an unusual result but in our practice it really is not! 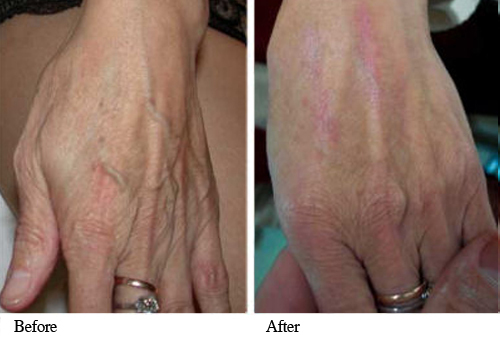 And the best part of this is that her skin will stay like this post treatment photo for many, many years to come. 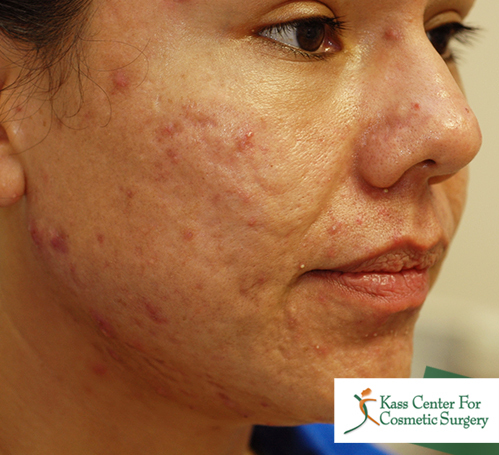 This 30-year-old patient came in requesting treatment for acne scars. She had practically given up all hope of improvement as she had seen many other doctors and had tried many other remedies and had already spent a lot of money seeking improvement. 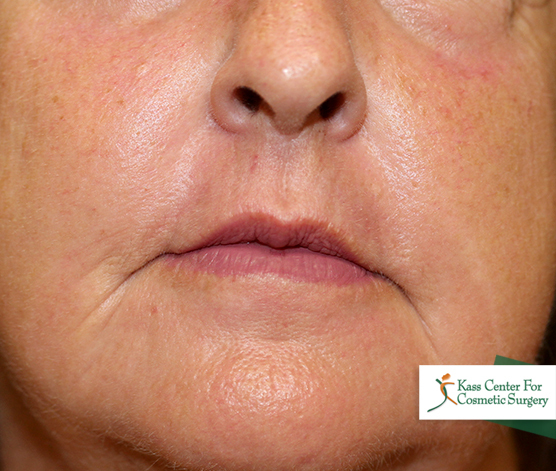 She received a Hetter Facial Resurfacing Procedure combined with Silikon 1000 treatments to the deep, depressed boxcar acne scars on both of her cheeks, her forehead, and chin. 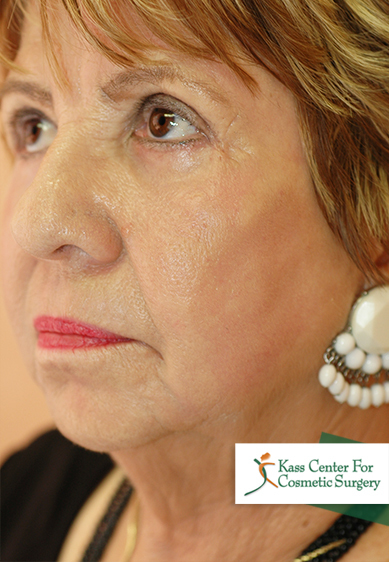 After the patient healed, she was ecstatic with the results that she and Dr. Kass achieved. This 65 year old woman presented because her eyes felt heavy. But even more, she hated the lines around her mouth. 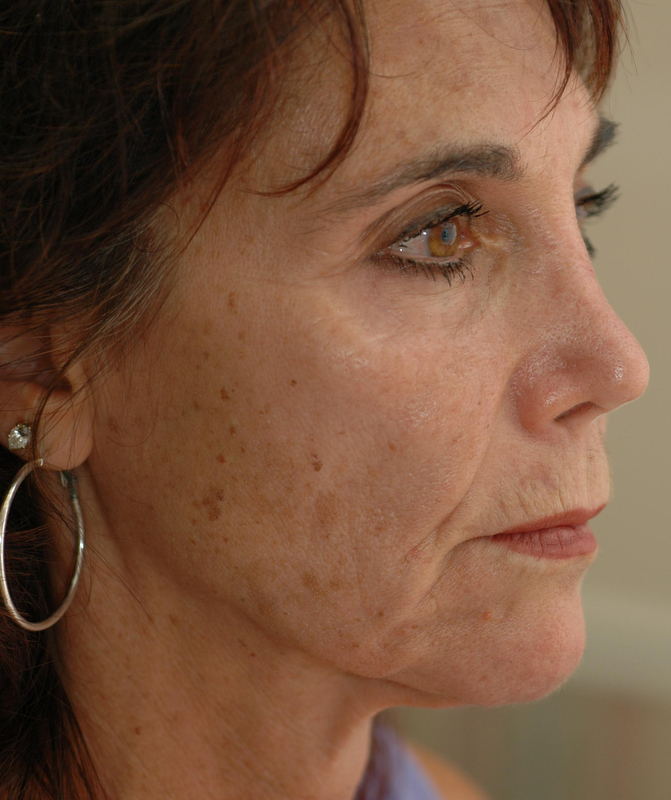 For her, we performed medically necessary surgery on her upper eyelids (ptosis repair), combined with lower eyelid surgery, and Hetter chemical peel with facial resurfacing. What did she think of her results? She said that after the surgery she felt great! She was amazed that no one could see any scars! 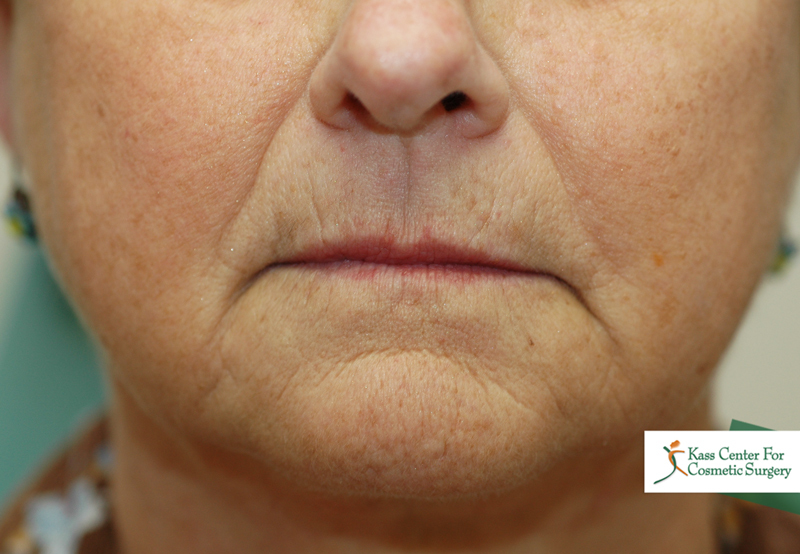 This 70 year old woman wondered what could be done to improve her jaw line, jowls, and lines around her mouth. 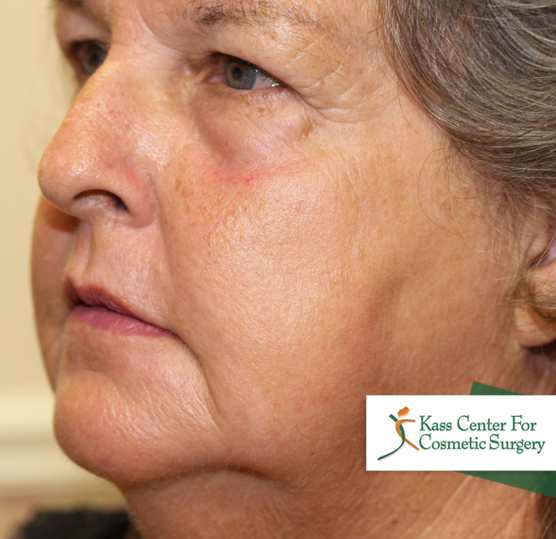 She was fearful of surgery because she had previously had non cosmetic surgery for cancer of the neck and specifically requested that we avoid the sternocleidomastoid muscle area entirely (the large fold at the bottom of the photo heading up toward her earlobe). 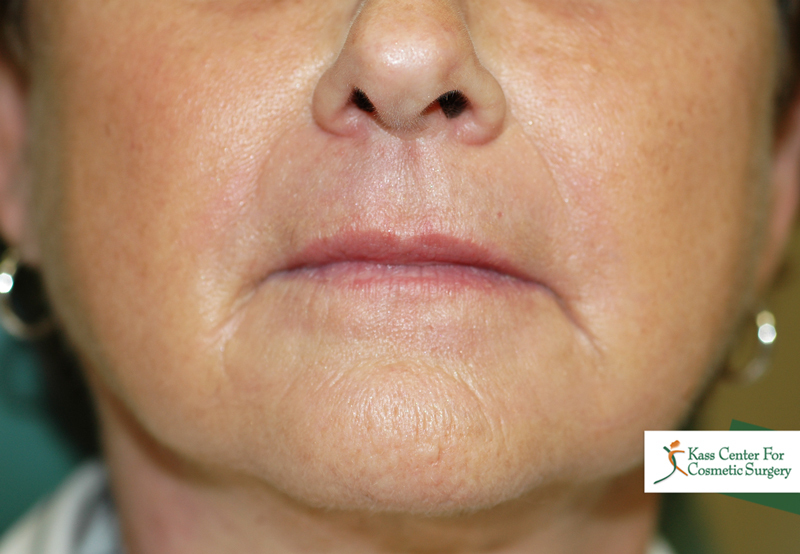 For her, we performed the Weekend Lift, the Neck Lift with liposuction and a limited suture platysmaplasty, and a Hetter chemical peel for facial resurfacing. We avoided the area of her understandable concern. Yet, she was delighted with her results! She said that we had achieved exactly what she wanted. By working within her stated goals and concerns, she remains one of our most grateful and happy patients. This 43 year old Medical Doctor came to see us for her most obvious facial pigmentation problems. Her concerns were that a peel may not heal well because of her skin color (she was of Indian descent). 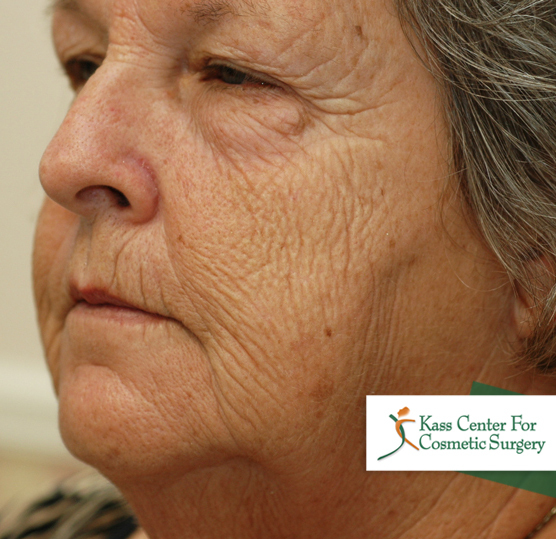 She came all the way from the Jacksonville area to see Dr. Kass based on his numerous excellent reviews. Dr. Kass explained to her that the beauty of the Croton Oil / Hetter Facial Resurfacing Peel is that it is not a one size fits all type of procedure. Gregory Hetter M.D. (who Dr. Kass recently had the honor of meeting in person) determined that peel depth can be varied by varying the strength of the croton oil solution used. 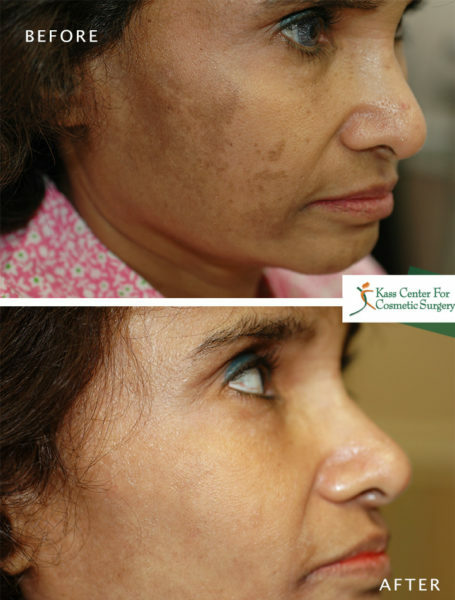 Because Dr. Kass uses different strength Croton Oil solutions, he has complete control of the peel depth and therefore has complete versatility to treat practically ANY patient regardless of skin color. 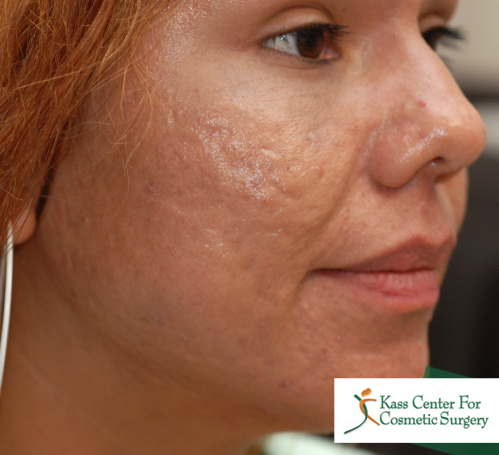 This procedure allowed Dr. Kass to address all of her skin concerns. Being only a few weeks out after treatment, she was so happy with her results! This mid 60’s year old lady grew up in the deep South long before the damaging effects of the sun, and the beneficial effects of sunscreens became known. This patient was of limited means. Certainly, she could have had a face lift, or a neck lift, or eyelid surgery and could have benefited from any one of these or all of these procedures. But what bothered her most, more than anything else, were the texture of her skin and the “railroad tracks” on her cheeks. Rather than schedule her for more expensive “incisional” procedures, Dr. Kass suggested the Croton Oil / Hetter Facial Resurfacing Peel. Dr. Kass believes that not only does this make the skin look better, but that there is no question that it decreases the propensity to develop nonmelanoma skin cancers. This is one reason why Dr. Kass has had this procedure himself and had done it for numerous of his professional colleagues! Unlike ANYTHING else, Dr. Kass believes that his unique modification of the Croton Oil / Hetter Facial Resurfacing Peel makes skin like new again! 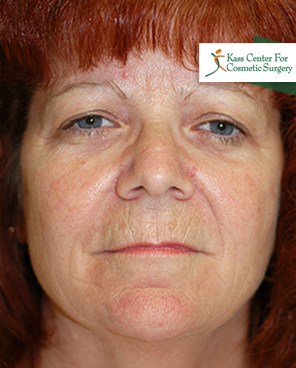 This patient believed that after treatment, her skin was “smoother than a baby’s bottom!” No more railroad tracks! What do you think? 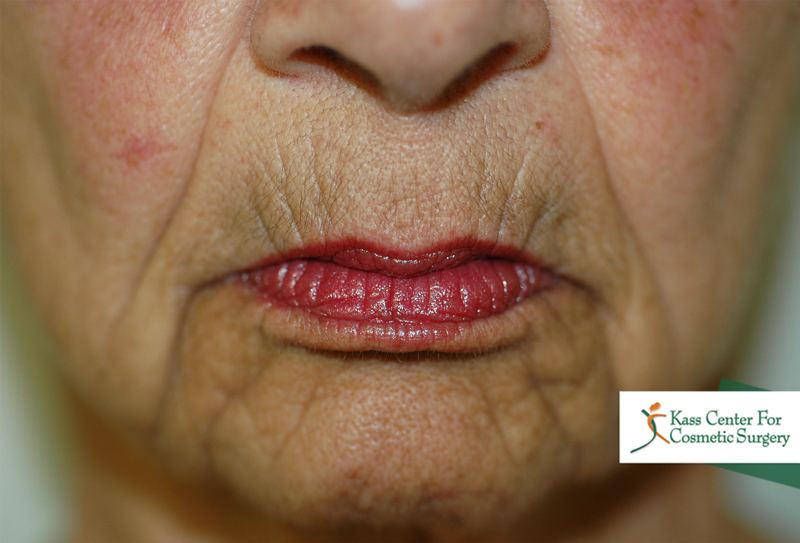 Although this patient initially presented for treatment of her eyelids and festoons (bags present below the inferior orbital rims on the cheeks), when asked, the patient confided that she absolutely hated the lines on her cheeks and above her upper lip. Dr. Kass suggested that at the time of cosmetic upper and lower eyelid surgery and bilateral midface lifts with festoon treatments, she should consider Dr. Kass’ unique and individualized adaptation of the Croton Oil / Hetter Facial Resurfacing Procedure / Peel. Please judge for yourself the results of this treatment. The patient could not have been any happier! 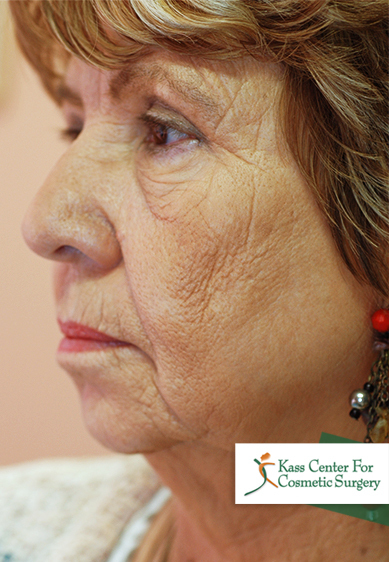 This 52-year-old woman presented because of the sagging skin on her upper eyelid. 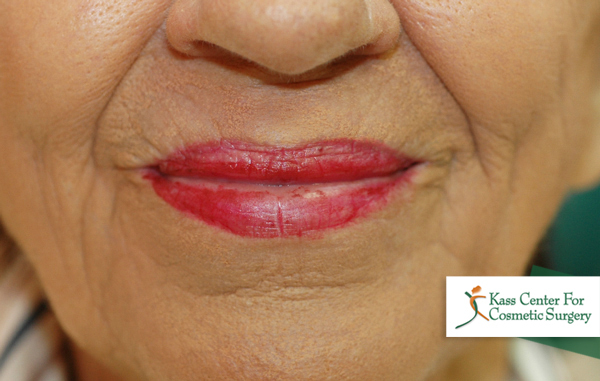 But even more than this, she disliked the lines around her mouth which she felt aged her prematurely. 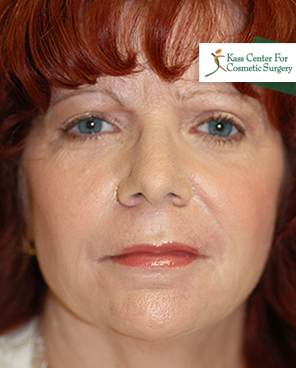 For her, Dr. Kass performed laser skin resurfacing and upper eyelid lifts. She was so satisfied with the results that Dr. Kass achieved that now, her primary concern was what others might think when she was seen with such an older appearing man (her husband)! So, she insisted that he see Dr. Kass to have his eyelids done! 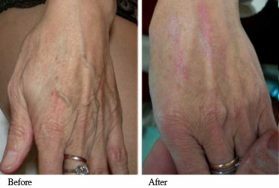 Wrinkles, age spots, sun spots, spider veins, pigmented and vascular lesions, are all outward manifestations of aging or sun damaged skin. 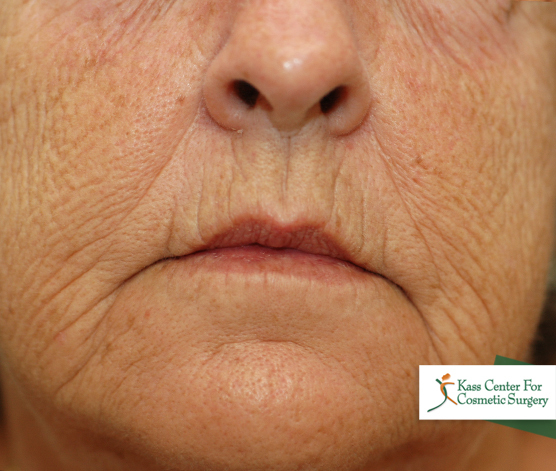 Once accepted as a fact of growing older, these skin imperfections can now be safely and easily treated. LHE has demonstrated a clinically proven ability to safely deliver more youthful looking skin and a high level of client satisfaction. 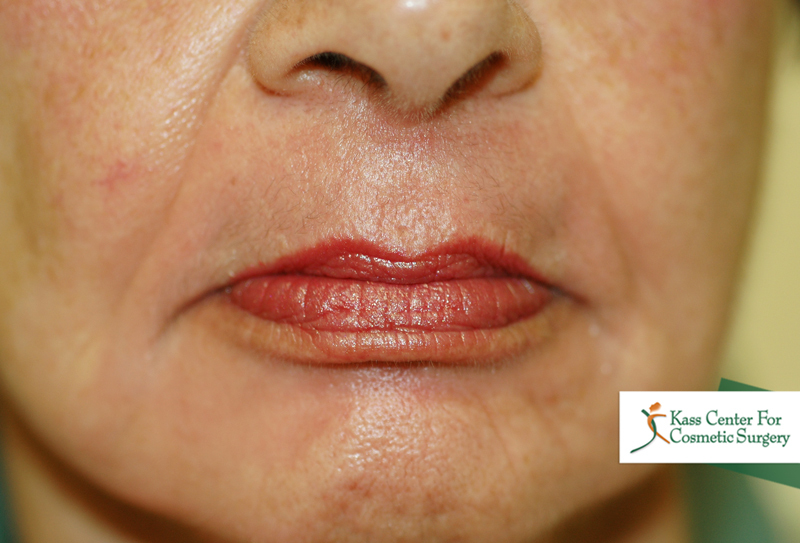 Another term often used to describe LHE is photofacial rejuvenation.